After graduating from Morehouse College with a degree an English Ben Cory Jones spent three years as a corporate spokesman and speechwriter on Wall Street for Bank of America. 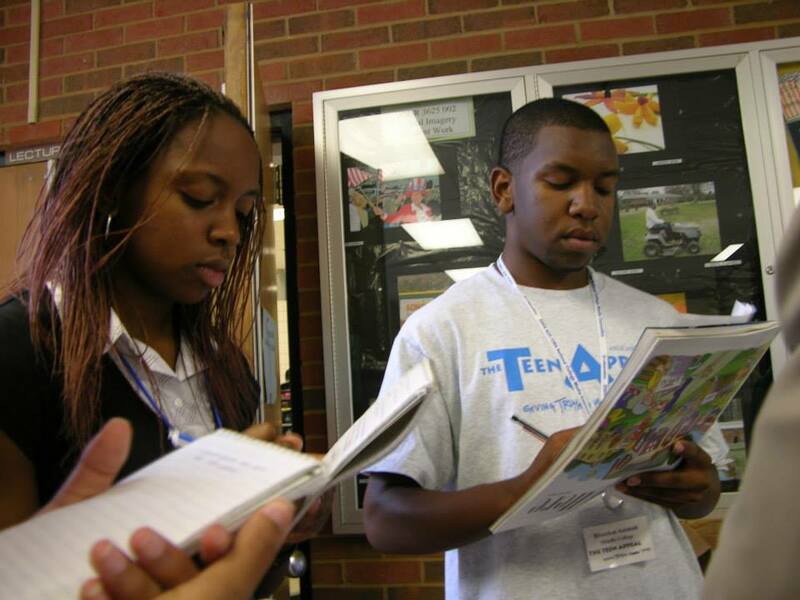 Two Middle College High School students take notes during the 2007 Teen Appeal camp at the University of Memphis. Folasade Omogun (left) received a B.A. in English and History from Clark Atlanta University and is currently a law student at the University of Tennessee in Knoxville, scheduled to graduate in 2016. She has studied abroad at Edge Hill University in London and the University of West Indies in Kingston, Jamaica. Branden Asemah (right) graduated from Bowdoin College in Maine with a B.A. in Gender and Women’s Studies/Africana Studies with a minor in Education Studies. He now works as an Associate Producer for Bloomberg Television in New York and previously studied abroad in New Delhi, India. In mid-November, Variety announced that Jones, along with “Straight Outta Compton” producer Matt Alvarez, writer/actress Lena Waithe (from Netflix’s “Master of None”), and Jones are producers for “Aint no Steppin’” a film in development from “Drumline” director Charles Stone III. Jones currently serves as a staff writer on the Amazon Prime series “Hand of God” and has a half-hour cable series “Bros” in development at HBO. Katori Hall is a graduate of Columbia University, the A.R.T. program at Harvard University and the Julliard School. Her short film “Arkabutla” is currently in production. Her most famous play “The Mountaintop” received the 2010 Olivier Award for Best Play and starred Angela Basset and Samuel L. Jackson when it debuted on Broadway. What do these two have in common, besides being Memphis-natives making their mark in the entertainment industry? Both participated in Teen Appeal while in high school (Jones at Central and Hall at Craigmont) and used the program to spark their writing careers. Through the program’s nearly 20 years of existence Teen Appeal has attracted talented students who have gone on to achieve noteworthy accomplishments whether or not they pursued careers in journalism and mass communications.These students have gone on to become print and broadcast journalists, public relations practitioners, advertising specialists, graphic designers, photojournalists, high school teachers, college professors, attorneys, documentarians and more. 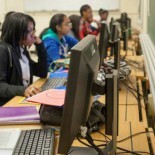 Students who have participated in Teen Appeal have graduated from colleges such as Bowdoin College, Howard University, Hampton University, St. John’s University in New York, University of Virginia, University of Southern California, Northwestern University, University of North Carolina, University of Notre Dame, Vanderbilt University, Washington University in St. Louis, Georgetown University and yes, the University of Memphis where the Teen Appeal office is located. Teen Appeal students have studied abroad (and received graduate degrees) in places like Jamaica, Panama, India, South Korea, Japan, the United Kingdom and France. Several have gone on to obtain law degrees in Chicago, North Carolina and Tennessee. Some of the most recent alumni are currently enrolled at the Wharton School of Business at University of Pennsylvania, Amherst College in Massachusetts, University of California Berkeley, University of Chicago, University of Missouri, University of Tennessee, University of Arkansas Pine Bluff, and Warren Wilson College in Asheville, North Carolina. While many of these students are pursuing journalism and communications, others have chosen fields such as business, economics, astrophysics and sustainable entrepreneurship. It is true that Teen Appeal attracts students of a high caliber. It is also true that Teen Appeal provides many students their first chance of having their writing and photography published for a wide audience, a chance to sharpen their communication skills, the opportunity to strengthen their critical thinking and analytical skills and their first acquaintance of a college campus. Over the years some things have changed, such as the number of graduate assistants working with the program, the number of high schools involved and the number of students who participate. The one thing that has not changed is the presence of the many youth of Memphis who give us the first preview of their brilliance before they go off to show the rest of the world. This entry was posted on December 7, 2015 by theteenappeal in Features, News, Opinion.